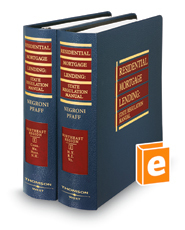 Quick and convenient access to information on first mortgage lending laws and regulations across the United States. Use this resource to enhance your overall understanding of the legal and regulatory environment of first residential mortgage lending. An alphabetical listing of topics of interest to mortgage lenders and brokers can speed research time. Discover how the courts have ruled in your jurisdiction. Find laws and regulations quickly and easily, as well as which state agencies and key personnel involved in regulating the industry. Helps locate hard-to-find original source material. States covered are: Connecticut, Maine, Massachusetts, New Hampshire, New York, Rhode Island, and Vermont.